QUESTION: Can you guess what the number one CAUSE of back and neck pain is that we see as osteopaths? It’s consistent, daily poor posture. 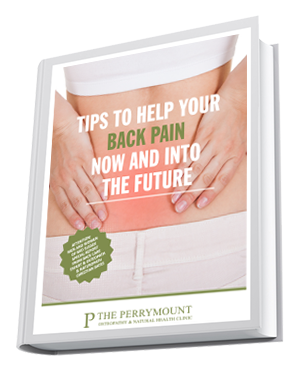 Helping this is absolutely vital for your longterm spine health and at The Perrymount we believe that prevention is better than cure. And prevention of spine pain is hugely dependent on improving your posture. Let me tell you how important your posture is. The average head ways 10 - 12 pounds and research has found that when we text on a phone and lean forward the forces exerted on our neck and spine reach 60 pounds! That’s the average weight of an 8 year old! I don’t know about you but I would not want to walk around with an 8 year old on my shoulders all day. 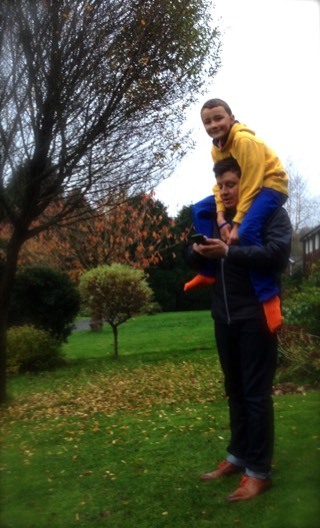 By the way that’s a picture of me with my 8 year old son on my shoulders. He’s heavy and it hurts after about 30 seconds! But texting isn't the whole story, all of us walk around, sit, drive and work at computers with a constant poor posture. 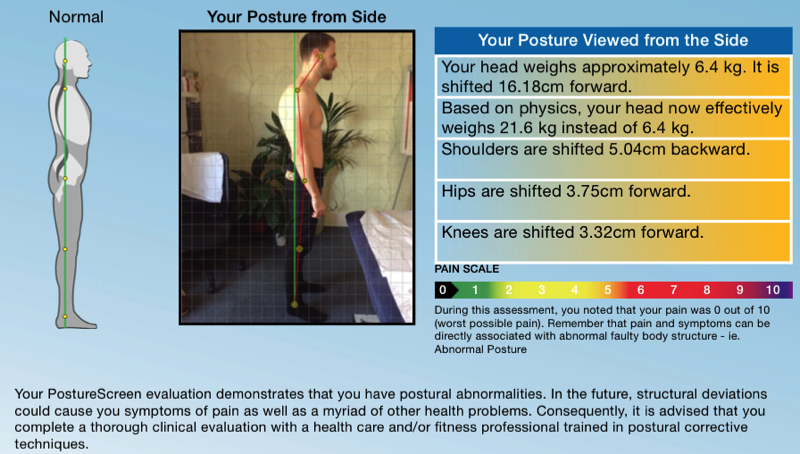 Have a look at this screen shot from Posture Pro. This young man has a 60 llb head, he’s not texting, it’s just how his posture is standing normally. For many years now it has been documented that for every inch your neck moves forward it adds an extra 10 llbs to the weight of your head! And all your neck and back muscles take this strain producing chronic pain. For me one of the most interesting things about this picture is how the forward neck posture majorly stresses the low back curve. This type of stress can give pain, wear and tear like arthritis and even bulges the disc to cause sciatica. 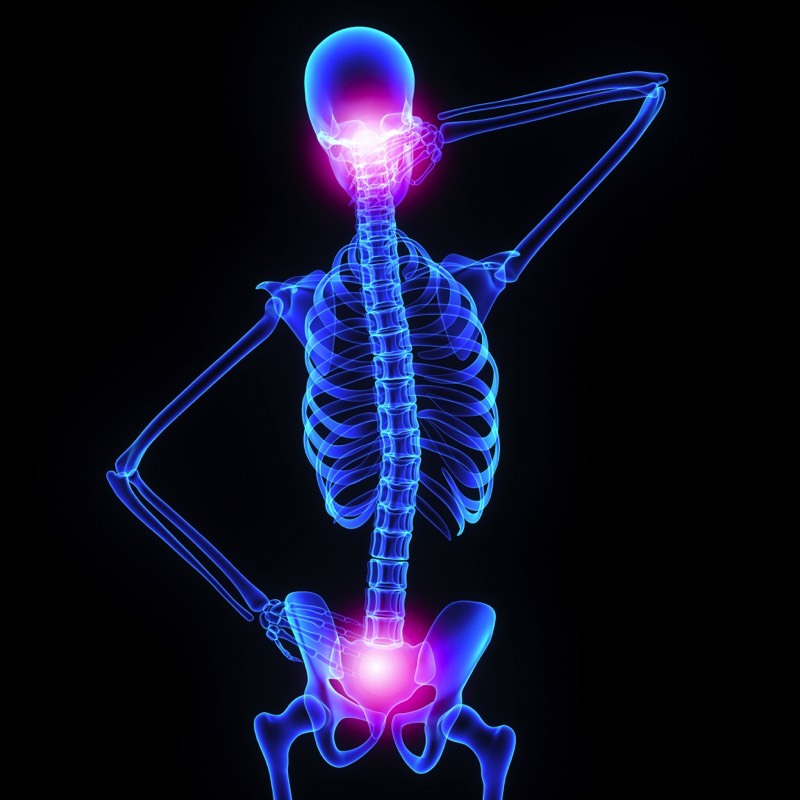 So part of a help plan for sciatica should be correct posture and neck treatment. Look at the picture of the slumped man again, notice what his tummy is doing. The rib cage is dropped down and forcing all his internal organs to get squashed. This affects how they function! The thing is you don’t get acute pain from this squashing, it just carries on for years, decreasing the flow of circulation to these vital organs making a slow but gradual disfunction. You can imagine this man might suffer constipation. If he went to the doctors he might get a laxative to help the symptom but of course he would never get the advice to have his posture checked or spine treated! But this is just what your osteopath at The Perrymount would suggest. Now let’s get even deeper into anatomy and I’m near 100% you would have never heard this before, unless you have read my back pain ebook. The nerve that runs down the back of your leg that gives sciatica, or the one to the front of your leg and actually any nerve from your low back also branches to your internal organs; so stomach, small intestines, large intestine, ovaries and testes etc. So when you have back pain from poor posture which affects pain nerves you also affect the nerves to your internal organs, because they all come from the same place. Above I mentioned the physical pressure of bad posture, now I’m saying the nerve irritation does the same. A double whammy. 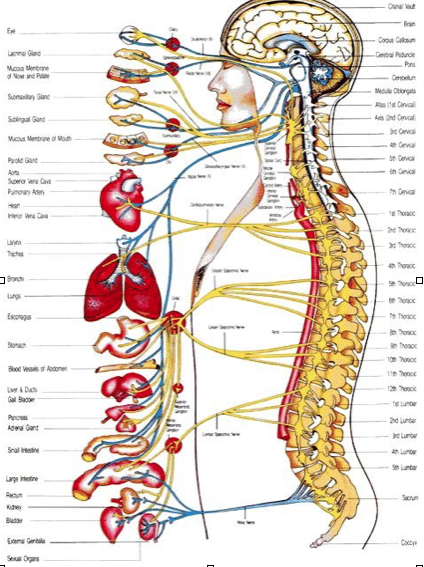 Have a look at this picture, it shows all the nerves that come out the spine and the organs they supply. 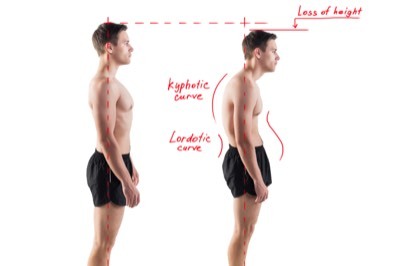 So far we have only looked at a posture that slumps forward, of course it can also go back and side to side. Going side to side is called a scoliosis. One researcher did an experiment looking at the very top vertebrae of our neck, called the atlas. He found that if the vertebrae had shifted left or right then there was a 98% chance that the persons whole weight had shifted that way too! And that was only one vertebrae of your spine gone wrong. Can you imagine then the changes that go through your low back, hip, knee, ankle and foot which cab cause pain in these joints too. I hope I am getting across to you the importance of your posture and spine health and that it actually has a dramatic and vital influence on your entire health. Osteopaths treat the spine and its associated muscles with this in mind and help the curves gently balance to calm the nerves to organs, muscles, joints, arteries, veins, ligaments, tendons, skin… you name it it has a nerve supply to some degree that comes from your spine. One of the most common causes of a weak "core" leading to back pain. NOTE: No amount of sit-up's will fix this!